He was drafted in the early part of the draft, in the first round, by a floundering but proud team from Pennsylvania. Despite success not seen by many at his position in his time with his team, which he helped lead back to the top and back to relevance, he never quite got the praise he deserved from the fan base for which he worked so hard to succeed for. They chided him with claims that he couldn't come through in the clutch, that he didn't care enough about the game, that he was replaceable. No matter who was behind him in the depth chart, a lot of people wanted the back up in over him stating that they would do better. Despite being a franchise player, the respect in the city he played for never seemed to have been earned despite franchise records and stellar play, praise from the pundits and on air talking heads who followed the sport the closest. When you read the above you think of Marc-Andre Fleury. 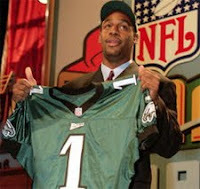 It also applies to Donovan McNabb. 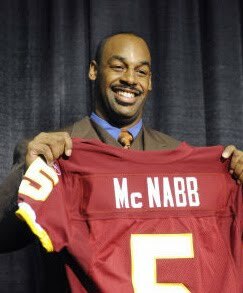 McNabb, taken 2nd overall by the Philadelphia Eagles in the 1999 NFL Draft, was the man who helped lead the Eagles to five NFC Championship Games and a Super Bowl. Who set all of the major Quarterback records for the Eagles franchise. Who was constantly battered in the Philadelphia media and by fans of the Eagles despite all of the success he lead them to. And both have many things in common. Since Fleury was drafted by the Penguins, expectations have been heaped upon him. He was thefirst #1 overall pick for the Penguins since Mario Lemieux in 1984. He was the franchise's first true "franchise goaltender" since Tom Barrasso, who led the Penguins to two Cups in the early 90s. He was expected to lead the charge into the next great era of Pittsburgh Penguins hockey. To many, the results have been mixed. Camp Number One argues: He's lead us to the promised land more than once, he's got all the skill in the world, and his numbers show the true potential and success he's brought to the franchise. The other Camp, Number Two, says: He's lead us there, but what has he done to help us win? He's collapsed when it matters and isn't exactly known for stepping up in the clutch. Marc-Andre Fleury is not above criticism, far from it. He goes through spells where he seems out of place and scrambles about, often allowing for soft and easy goals. This is not unlike Donovan McNabb in his early years, scrambling for plays when he had receivers wide open down the field. Fight or flight instincts take over and he just does. They both make plays that make you shake your head in disgust and and in amazement. For every soft goal or untimely interception Fleury and McNabb have made, there are about ten things that are extremely difficult that they've made look easy. Be it a split kick save on a sure fire empty net or a scramble out of a sure thing sack to toss a flick of the wrist deep bomb for a touchdown, they all have our attention. The problem is that for many, that interception or five hole goal will always resonate stronger than the heights to which they lead their teams. Complain and moan all day long about the soft goals Fleury gives up, about the bad rebounds that he allows, about his poor stick handling abilities. Any supporter will concede that these are legit concerns that haven't seemed to have faded over time. What they will also point out is that despite these problems he's had seasons of 40, 35, and 37 wins. As Ray Shero stated accurately this off season you cannot simply replace that. He holds franchise records and he is a game changer. These same things applied to McNabb in Philadelphia. 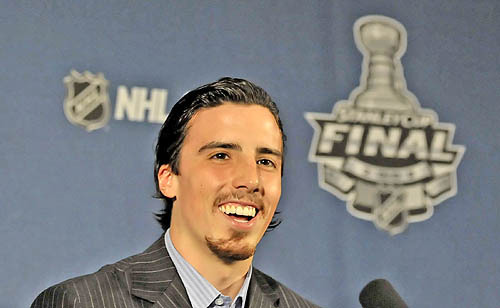 At the end of the day, Marc-Andre Fleury is much like Donovan McNabb was in Philadelphia. He's an under-appreciated star that is crucial to the clubs success. Without him, they don't go as far as they've gotten. While he has other stars around him, his contributions have been immeasurable. They are both quirky and can be maddeningly inconsistent. Through this season a lot of these same questions have come up with Fleury. Uncomfortable outings against Philadelphia and Toronto plus an implosion by the whole team (led be a soft game winning goal against Montreal) have called for many to toss Fleury out with the trash. Knee jerk reactions if there ever were one. 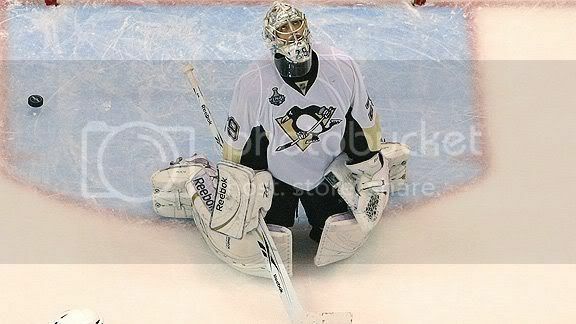 Where the parallel needs to end is what happens to Fleury. He's important to the Penguins. He needs to stay with the Penguins. If he's traded to a rival, as McNabb was, you'll be cursing to yourself every time Fleury shuts out the Penguins while the new goaltender can't quite make it happen. Just ask Eagles fans how they felt when McNabb beat the Eagles in a Redskins uniform. Depending on this year Marc-Andre Fleury may not be here to stay. Few and far between is the talent that he possesses. Hopefully unlike McNabb, he will stay and lead the Penguins. And hopefully unlike McNabb, the city of Pittsburgh will finally accept him for what he is: much more imporant than they think. As McNabb returns to Philadelphia tonight to have his number retired by the Eagles he'll likely be met with applause and appreciation by the Philly faithful. One day the same will happen for Marc-Andre Fleury. Let's hope he never has to don another uniform before that happens. The above post is an altered version of a previous post by the author on his website. Nicholas Case is the owner of caseandpointsports.com. He can be found on Twitter at twitter.com/Nick422 and he always enjoys hearing from you. Yes you. You can reach him at nick@radio-pi.com.